Calibur | DREVO :: Game With Cool Tech. Calibur features Bluetooth 4.0/USB dual modes, USB charging and tablet&phone compatibility. Choose self-customized backlighting, it's all about uniqueness. System Requirement: Bluetooth 4.0 receiver / Windows 10 / Android 4.4 and above / IOS 7.0 and above / Mac OS 10.10 and above. Attractive Features: 71/72 keys Tenkeyless with customizable lights, true NKRO that prevents key ghosting, high-quality keycaps that will stay clean, RGB backlighting Mechanical Keyboard. Lighting Effects: 7 different lighting effects, such as Reactive Mode, Wave Mode, Ripple Mode, Aurora Mode that will not conflict with customizable lights. Mechanical Switches: Mechanical Keyboard Black / Blue / Brown / Red switches with endurance up to 50M key presses, ten times longer than membrane keyboards, and always perform as the first time. 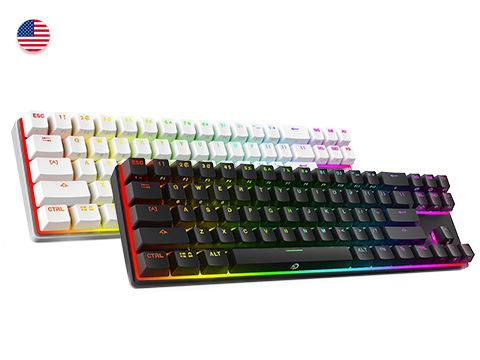 *Please note that DREVO Calibur 71 version and Calibur 72 black keyboard use ABS keycaps which are transparent. DREVO Calibur 72 white keyboard uses PBT keycaps. The PBT keycaps are not transparent. The backlight effect on Calibur 72 white keyboard is atmosphere light, it's at the bottom of the keycaps.